Look forward to your next big event with our free downloadable desktop countdown timer. Stylish digital display, multiple snooze, alarm features and more! Are you someone who ends up spending a lot of time in front of the computer? You are certainly not alone! The internet provides people with access to a variety of features including social media, games, videos, news etc. Hence, it becomes very easy for anyone to spend a lot of time in front of the computer without even realizing that a lot of time has passed. If you would like to keep a track of the time that you spend on your computer, you can opt for an effective software like Countdown Timer. It is a time calculator which is available for free. The Countdown Timer is a software which has been created to help people in effectively and efficiently managing time. It comes with a variety of features which will assist you in keeping a track of the time that you spend on your computer. It can also help you in being reminded of an important event to come, and the time left for it to begin. 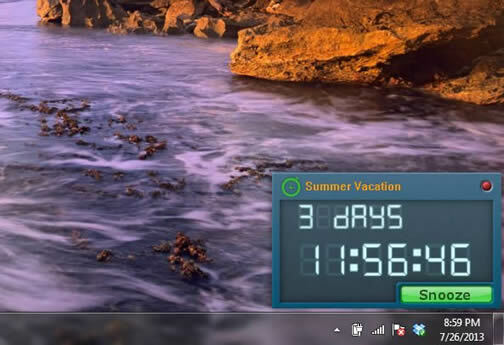 When you are going online, you can use the software to start the countdown clock so that you can be reminded of the amount of time you are spending in front of the computer. Countdown Clock - this is a very useful feature available with the Countdown Timer. The feature can have a variety of uses. For example, you can use it to keep a track of the amount of time left for an event to begin. It can be very useful for those who find it hard to remember the dates for business meetings, appointments and interviews etc. You can add the dates of the appointments or meetings so that you will not forget them. The clock will display on the monitor of your computer and will not interfere with any other applications. Daily Alarm - this is another useful feature of the software. It allows you to add a daily alarm so that you are reminded of something important that needs to be done, on a weekly or daily basis. The process of adding the daily alarm is very easy and you can choose the title of the alarm, alarm time, and also the days on which the alarm should be active. You will also get the option to add the alarm for any particular day of the week, or add it for all the 7 days. It also provides you with an option to choose the alarm sound. Countdown Calendar - for all those forgetful men out there, the feature can be very handy as it can help them in remembering their anniversaries and the birthdays of their spouses etc. You can easily edit any date to enter a special occasion or an event. You can also set an alarm for those particular dates so that you are reminded of those events. The process of adding, deleting and editing the calendar events is very easy as well.